On 5th May, 2016 I met the Cabinet Secretary, Government of India, and once again draw his attention towards my letter NO.NC/JCM/2016 dated: May 2, 2016, a copy of the said letter was also handed over to him. During discussion I also mentioned about the anguish of the Central Government employees because of inordinate delay in implementation of VII CPC recommendations and also their anxiety about enhancement in Minimum Wage as well as Multiplying Factor etc. I also demanded a meeting with the Staff Side, NC/JCM on all the issues raised by the Staff Side, NC/JCM and demanded that, views of the Official Side should also be made known to the Staff Side. The Cabinet Secretary agreed to hold a meeting with some of the Secretaries, particularly with the Secretary(Exp. ), Secretary, DoP&T and whosoever is required, particularly for discussion. It has been assumed that, a Cabinet Note is being prepared and is likely to be submitted to the Cabinet, Government of India, very shortly. 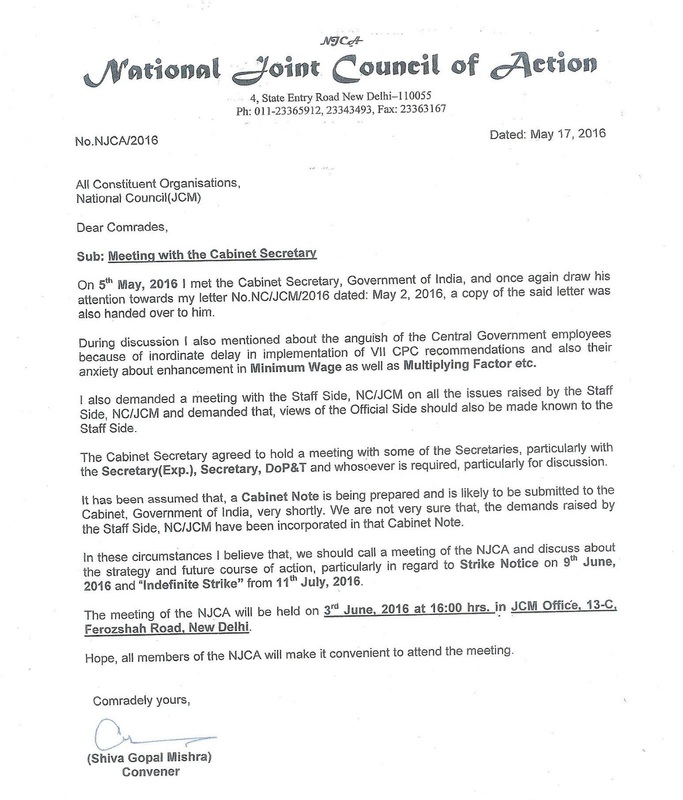 We are not very sure that, the demands raised by the Staff Side, NC/JCM have been incorporated in that Cabinet Note. In these circumstances I believe that, we should call a meeting of the NJCA and discuss about the strategy and future course of action, particularly in regard to Strike Notice on 9th June, 2016 and “Indefinite Strike” from 11th July, 2016. The meeting of the NJCA will be held on 3rd June, 2016 at 16:00 hrs. in JCM Office, 13-C, Ferozshah Road, New Delhi. Hope, all members of the NJCA will make it convenient to attend the meeting.